Talks are taking place between the Iraqi government and some insurgent groups, a senior Iraqi official says. Saad Yousif al-Muttalibi, of the Ministry of National Dialogue and Reconciliation, said none of the groups were linked to al-Qaeda in Iraq. Mr Muttalibi said the talks might be getting close to a point where some of the groups lay down their arms. 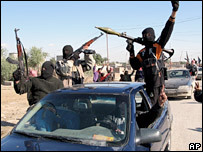 It comes after Iraq's vice-president called for talks with insurgents to try to bring peace to Iraq. There has been no let-up in violence, meanwhile, as eight al-Qaeda linked militants were killed in fierce clashes with US and Iraqi forces near the Sunni stronghold of Falluja, Iraqi and US sources said. Five Iraqi policemen were also wounded in the battles, which went on for five hours. The Associated Press news agency said US warplanes were involved in the clashes in Amiriyah, west of Baghdad. Elsewhere, five insurgents died in a US raid on a bomb-making factory near Taji, about 20km (nine miles) north of Baghdad, US military officials said. Mr Muttalibi told the BBC discussions with some militant groups were under way. "We've already established links and contacts with major insurgent groups. "One of the aims is to join with them into the fight against al-Qaeda. We are almost getting there and to join forces to attack al-Qaeda to get them out of Iraq." Have Your Say: Should Iraq talk to insurgents? The BBC's Hugh Sykes in Baghdad says it is understood that membership of the groups ranges from civil servants to people with military expertise. Mr Muttalibi said the view that you cannot talk to terrorists is very over-simplistic. Our correspondent says Mr Muttalibi ruled out surrendering to terrorists but the minister said sometimes one has to negotiate with them to understand what they want. In an earlier interview with the BBC, Vice-President Tareq al-Hashemi said he believed there was "no way but to talk to everybody" with the exception of al-Qaeda. Mr Hashemi, a Sunni, has personal experience of Iraq's violence. Last year his sister and two of his brothers were killed. But he said the only way for Iraq to make progress is for negotiations to take place. Apart from al-Qaeda, which Mr Hashemi said was "not very much willing in fact to talk to anybody", all parties "should be invited, should be called to sit down around the table to discuss their fears, their reservations". Meanwhile a senior aide to radical Shia cleric Moqtada Sadr, Ahmed Shibani, has been released after more than a year in US custody, the Iraqi prime minister's office said. Mr Sadr's Mehdi Army militia has been blamed for scores of sectarian killings in Baghdad but is also a crucial power-broker, forming part of Iraq's coalition government. A multitude of different groups are reckoned to be behind the violence in Iraq, which claims the lives of hundreds of people every month. They range from Sunni al-Qaeda sympathisers attacking foreign troops and bombing Shia marketplaces, to Shia militias killing Sunni civilians and forcing them to leave their homes.